We are the worlds leading source for used classic parts. We search the world for those hidden farms and garages and rescue the old iron and get it back on the road. We search America for the best people we can out there who work on old iron. If you know of a good mechanic or body man let us know and if he’s good enough I’ll add him to the list. 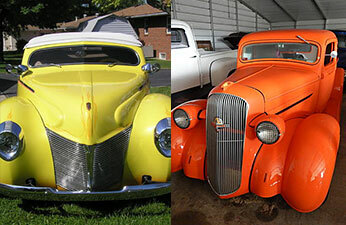 We represent over 25 classic and older car salvage yard with a total of over 50,000 cars and growing every day. If you’ve got a question, visit our FAQs page for helpful information. Post your own old car listing for 90 days! We’re the one-stop shop of anything old iron! Our client salvage yards have over 66,000 vehicles, millions of parts and hundreds of restorable vehicles for sale. Click on the Salvage Yard icon to checkout their inventory. Go to New Old Stock (NOS) and After Market Parts icon for those auto parts stores that sell those hard to find NOS, reproduced racing, and, rebuilt parts for older rides. Our goal is to find you everything you need for your classic and place it in one place to make your job easier. Check the Sections first but if you don’t see what you need use our search engine to find it! All sale must be done through the website, The Old Car Guy is out searching for more cool stuff and building the world best place to find Old Gold.